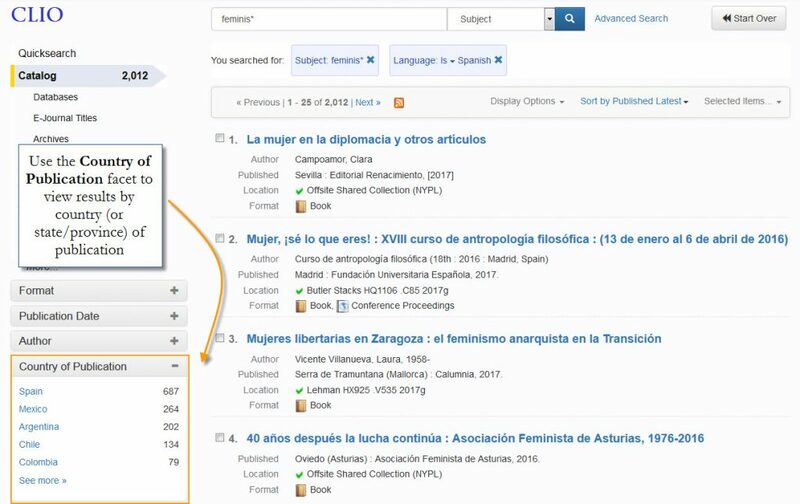 CLIO has added new functionality designed to get researchers to our most frequently used resources and web sites with less typing and fewer clicks. The links are chosen as the most likely “best link” for a given resource. In the example above this is the one (and only) record in CLIO that provides immediate electronic access to the entire run of the New York Times. Selecting the link (by keyboard or mouse) will take you directly to that resource. As always we’ll be interested in hearing how this works for you. Your comments and suggestions play an important role in guiding our work to keep making CLIO better. 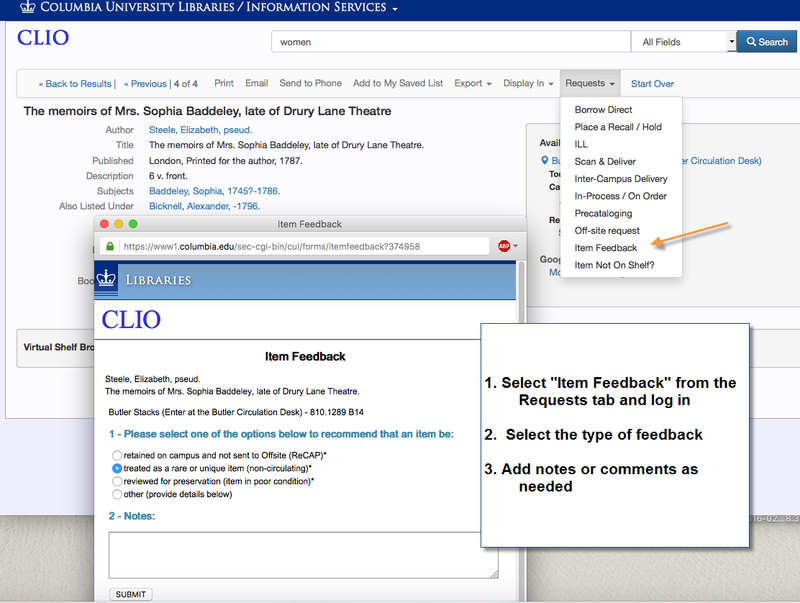 Please use the Suggestions & Feedback form under the “Help” menu in the upper right corner of CLIO, or Ask a Librarian. This entry was posted in News on August 10, 2018 by Sarah Witte. Reader feedback helps us to fine-tune our collections and services. 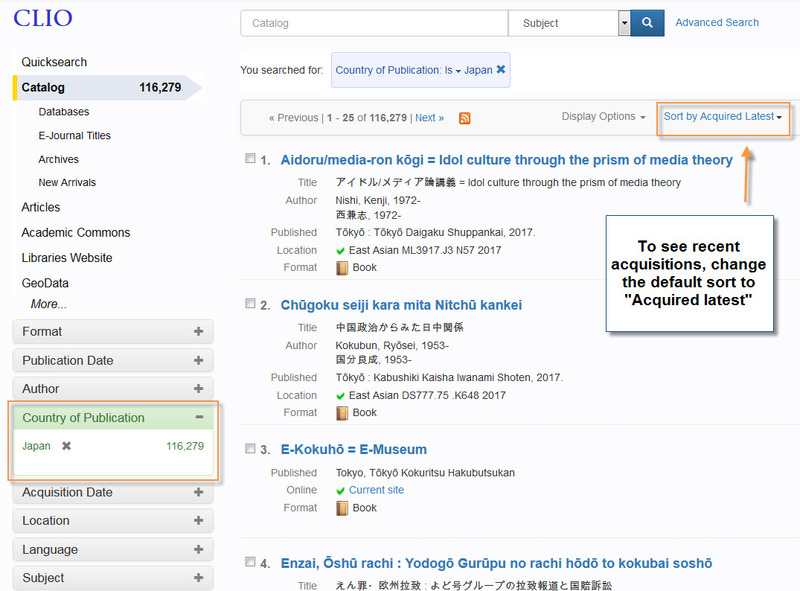 One recently requested upgrade to our catalog has been the ability to download citations for the books that one has checked out. 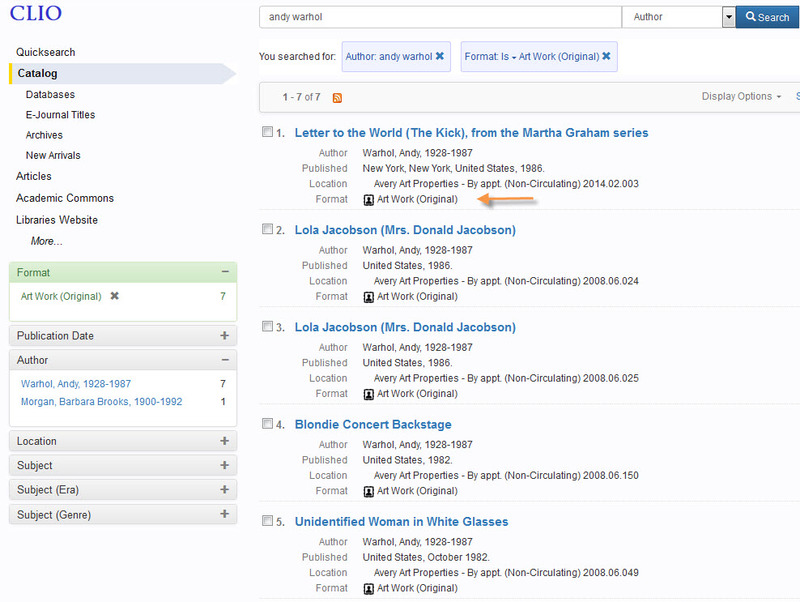 Thanks to the Library Information Technology team, this is now possible. Note that this procedure uses My CLIO rather than My Library Account and works with Zotero Standalone on FireFox, Chrome, and Safari (but not IE). Zotero should be open and the folder into which you wish to download selected. Zotero can be downloaded from zotero.org. One must also download a connector file for the browser (or browsers) one wants to use. 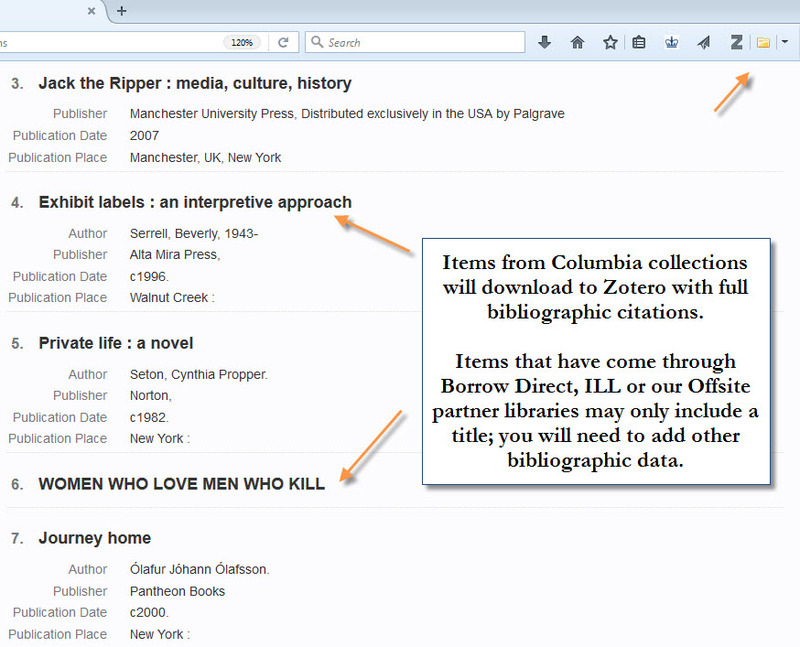 Instructions for using Zotero are available on the site, and Columbia Libraries offer workshops on its use. See the listings at http://library.columbia.edu/research/workshops.html. 3. Click on “My CLIO” and then log in with your UNI and password. 4. Your name and UNI will appear on the blue menu bar just to the left of Feedback/Help. 6. You will see the appropriate Zotero icon (folder for a list, single icon if there is only one checked out item) in the place it usually appears on the address menu, and can now download the titles in the list to Zotero. In Chrome and Firefox the download icon will appear to the right of the URL/search box; in Safari it will be immediately to the left of it. These directions are for downloading the titles you’ve borrowed. 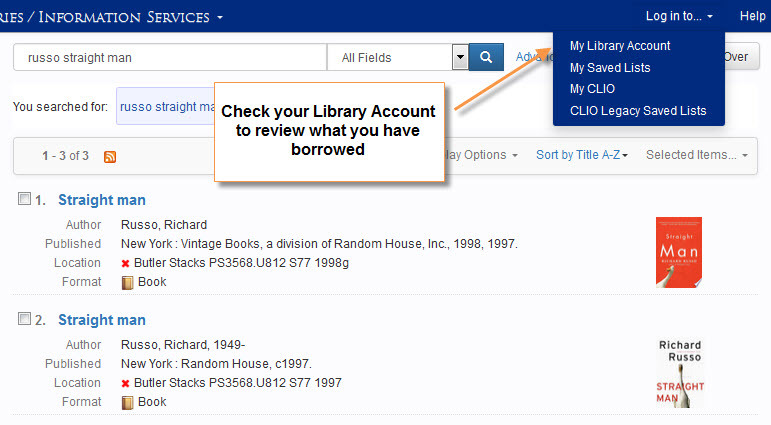 To renew the titles, or to see items that are being held for you, use “My Library Account”. Have a question or comment about CLIO? Click on “Help” in the upper right corner of each screen to connect to Ask a Librarian, view CLIO search tips, report an E-Resource problem or submit CLIO suggestions & feedback. This entry was posted in News on March 6, 2018 by Sarah Witte. This entry was posted in News on February 21, 2018 by Sarah Witte. 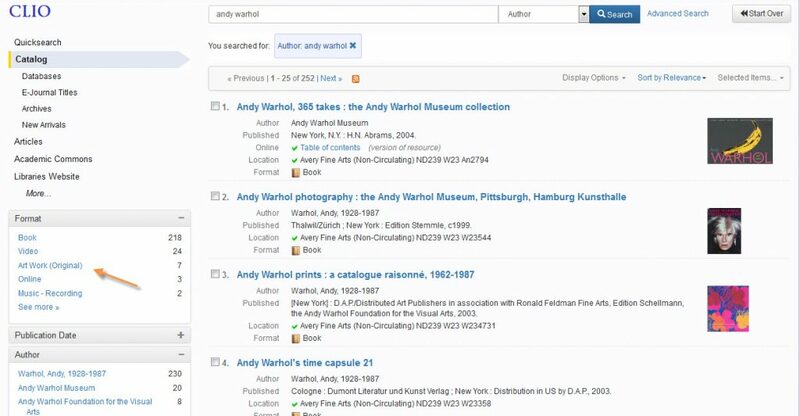 The Shared Collection Service, developed in partnership with Princeton University Library and The New York Public Library (NYPL), has launched! 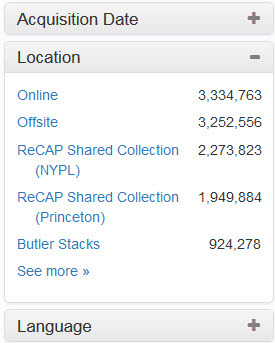 More than four million titles (comprising over seven million items) from New York Public Library and Princeton University Library are now available for request in CLIO. Columbia faculty, students, and staff can request direct delivery of these items to campus. CLIO catalog holdings listed by top locations. 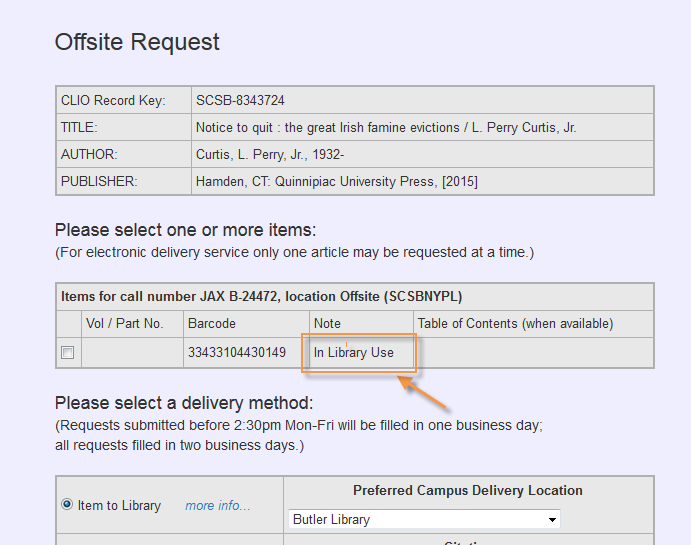 “In Library Use” indicates that the title can only be used onsite in the libraries. This entry was posted in News on October 12, 2017 by Sarah Witte. New Video: What is CLIO? Barnard’s Instructional Media and Technology Services (IMATS) has produced a great new video introducing CLIO to a first year student. This entry was posted in News on October 17, 2016 by Sarah Witte. Are you sometimes puzzled about which form of a name (Rachmaninov or Rachmaninoff?) to use when searching the catalog? CLIO will now find variant forms of names and subjects. Libraries use standard forms of names and subjects in catalog records to ensure that, for example, all works by a given author will be cataloged under the same form of the name. 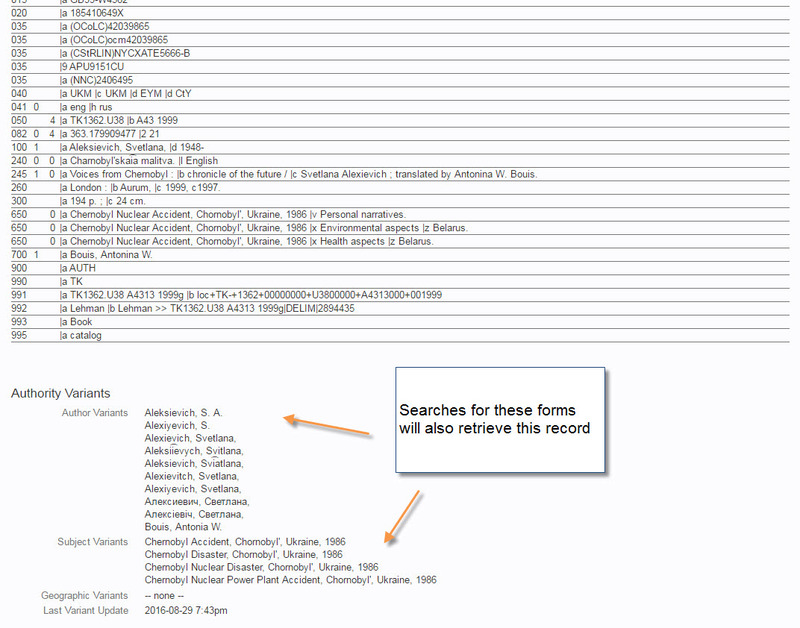 The challenge for libraries has been to enable researchers who may use different forms of these names or subjects in their keyword searches to find the records that contain the standard forms. The Library of Congress Authorities file includes references from alternative forms to the standard forms that have been chosen for use in records. CLIO now uses these to retrieve relevant records when alternative forms are used in keyword, author, or subject searches. For example, library catalog records use the official Arabic name of the Palestine Liberation Organization, Munaẓẓamat al-Taḥrīr al-Filasṭīnīyah. 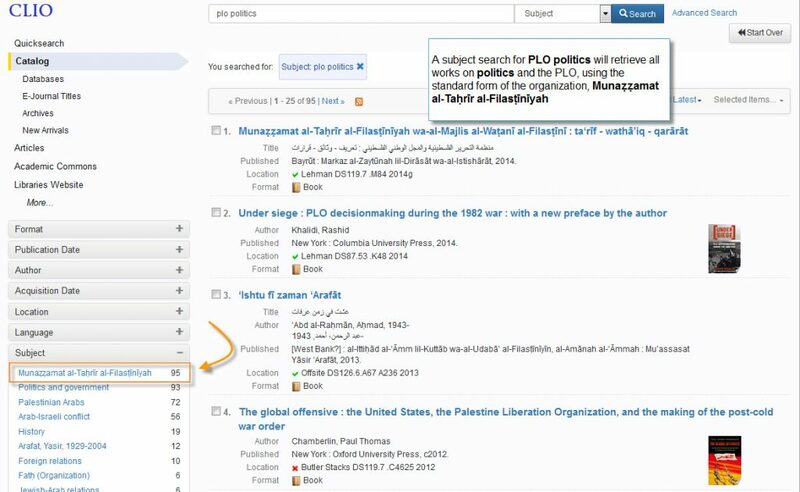 CLIO’s use of references from alternative forms will enable a patron’s subject search for the English forms PLO or Palestine Liberation Organization to include this standard form and retrieve all relevant books on this organization. This entry was posted in News on September 27, 2016 by Sarah Witte. 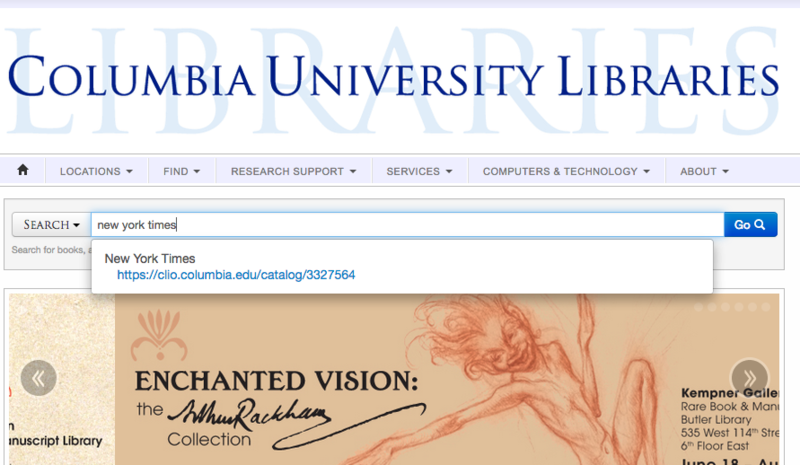 Columbia University’s collection of art works and cultural artifacts will soon be discoverable through CLIO. Art Properties, based in the Avery Architectural & Fine Arts Library, oversees the art collection owned by Columbia University. Comprised of more than 10,000 works of art in all media, displayed in buildings at each campus and held in storage, the art collection reflects all cultures and time periods. The collection also includes the public outdoor sculpture on campus. The mission of the University art collection is to support curricular integration, educational programs, and research and study purposes. As an extension of this teaching-and-learning mission, Art Properties also participates in loans to museum exhibitions worldwide. In addition to this test in CLIO, Avery staff and OSMC are collaborating on modeling Art Properties data as linked data, as part of a grant funded project led by Stanford University Libraries. This entry was posted in News on May 3, 2016 by Sarah Witte. This entry was posted in News on February 18, 2016 by Sarah Witte. Zotero is a free citation management program that helps you collect, organize, cite, and share your research sources and enables the download, capture, and indexing of full text, web pages, and research notes. It also allows you to insert citations in Word documents in a wide variety of writing styles, such as APA, Chicago, etc. You have a choice when you download Zotero. 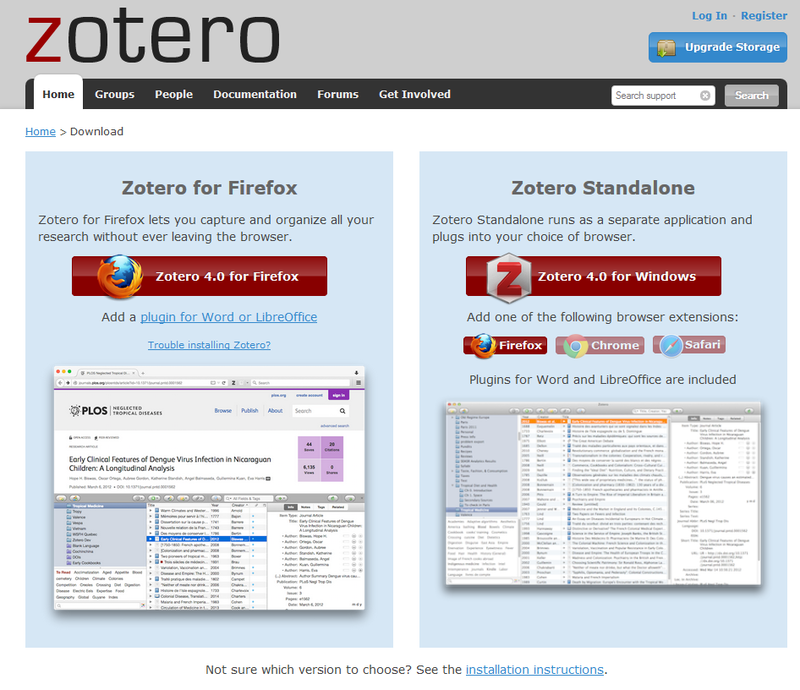 You may download either Zotero for Firefox or the Zotero Standalone. If you download Zotero for Firefox, be sure to also download the Zotero plug-ins for Microsoft Word or LibreOffice. If you download Zotero Standalone, be sure to download at least one browser connector so that you can pass citations from your browser to Zotero. There are helpful web tutorials on the Zotero site, but the libraries are also here to help you use Zotero. RSVP (dhc@library.columbia.edu). If you’re bringing your laptop, download Zotero before the workshop. Visit the Library Workshops page to see other workshops being offered this semester. This entry was posted in News on February 1, 2016 by Sarah Witte. Most books and bound periodicals may be returned to any Columbia University Library. Book bins are usually located near library entrances. Borrow Direct books may be returned to any library circulation desk. Material borrowed from: Law, Teachers College or Jewish Theological Seminary, which have separate library circulation systems. Your library account will display items borrowed from most Columbia Libraries and Borrow Direct. Items borrowed through ILL or from Law, Teacher’s College and Jewish Theological Seminary will display through those accounts. If you have questions about this service, please contact staff in the Library Information Office. This entry was posted in News on December 15, 2015 by Sarah Witte.